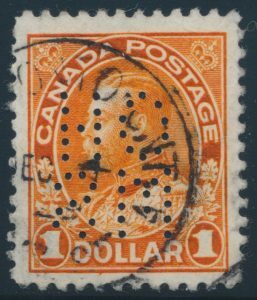 Lot 473 Canada #OA122b 1912 $1 Admiral Wet Printing Official, Perforated 5-Hole OHMS, (position B, with missing hole in S) used with Toronto DEC.4.1929 c.d.s. cancel, very fine. A rare wet printing stamp. Catalogue value given is for the later dry printing variety. Unitrade CV$216, sold for C$300.00 plus 15% buyer’s premium. 613-567-3336 tel. | 613-567-2972 fax.